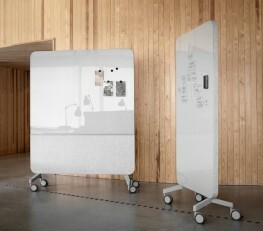 A freestanding mobile whiteboard featuring a drywipe and magnetic receptive whiteboard on both sides with built in acoustic panels to the lower sections of the unit. The acoustic panels provide sound deadening and reverberation reduction properties ideal for busy offices and open plan spaces. 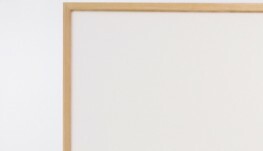 The frameless whiteboard panels are manufactured from the same high-quality material used in our other ThinkingWall products. The unit is set on a sturdy base with 4 lockable castors for easy manoeuvrability. 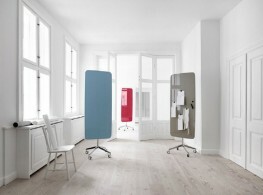 The clean, simple base features an exposed plywood edge for a contemporary look and feel. 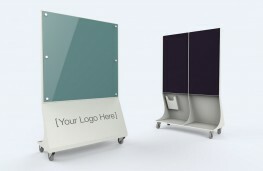 The ThinkingWall mobile acoustic freestander is ideal for open plan office spaces. 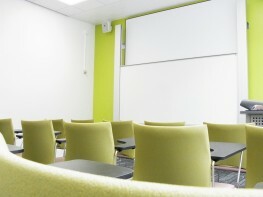 Its portable nature provides a large mobile writing area when these are often in short supply whilst the acoustic panels give sound deadening properties in busy, high traffic areas.